The boss of Reading and Leeds festival has said if headliners Guns N' Roses arrive on stage late, as they did in 2002, he'll pull the plug on their set. 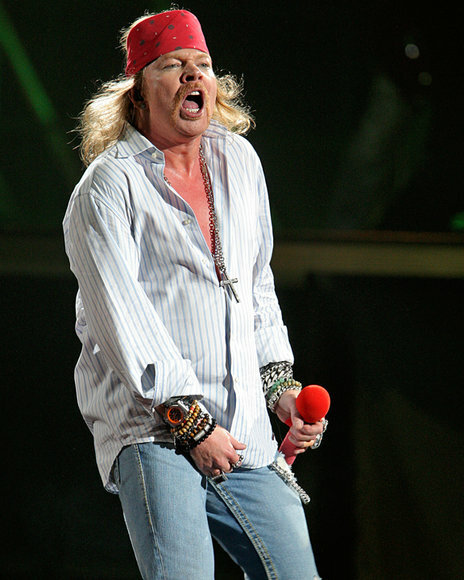 Eight years ago Axl Rose's band were over two hours late at Leeds - it landed the festival trouble with the local council. "If Guns N' Roses decide to take to stage as late as they did in Leeds some years ago then the performance just won't happen," said Melvin Benn. "I've had a very heavy warning from the local councils. There is a curfew - it's a very strict curfew." The legendary rockers will headline the Friday night of Reading (27 August) and Sunday night at Leeds (29). "We got away with it once," added Benn. "We won't get away with it for a second time. "Unfortunately, if the band chose not to take to the stage on time there's really nothing I can do. I won't be allowed to break the curfew. "The truth is - it's threatening the viability of the festival. It threatens the licence. It really is quite important." Last week the festival had to move to quash rumours that Guns N' Roses had cancelled their performance after someone hacked into lead singer Axl Rose's Twitter account and said the gigs were off.